Lyrical and nostalgic, this novel gives you the simplicity, trust, and connections to ignite your own spirit insights. It’s like riding your bike on a sweet summer day, exploring all the familiar places – knowing the real adventure is taking place deep inside. There is nothing common about the friendship between a muse as ageless and solitary as the oak trees in Paddington Cove and a proper, young lady of Jane Austen’s England. Old Maggie is guided by serendipity, intuition, and coincidence. Lydia has only known the dictates of family and social expectations. Together they find their way to unexpected treasures that celebrate their spirits. You already have your answers. 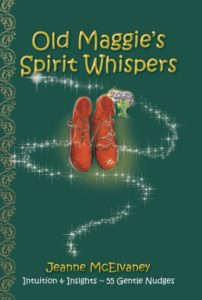 With 55 spirit whispers, this tale reminds you to listen. Old Maggie waited for the outsider to gather her belongings and it took only a moment for them to be on their way. Each one took an end of the burlap bag while the young woman carried her light case with her other hand. As quickly as they left Paddington Cove, Old Maggie guided them on the most direct route to her cottage, something she rarely did. But this day required ease and expediency, and they arrived at her cozy, dry, warm home in half an hour. Neither had spoken during their wet trek to the cottage and Old Maggie merely indicated the pegs on the wall near the fireplace as she laid the burlap bag on the large hearth and removed her cape. Her guest followed suit, hanging her pelisse beside the cape before nearly collapsing into one of the two chairs in front of the fire. With this admonition, Old Maggie left her brooding guest and went to work preparing them a midday meal that would chase away the cold. She soon brought a special brew of strong, hot tea, leaving her guest sipping its soothing effect while she retrieved the bowls of leftover potato soup. The tea had already begun changing the course of the on-coming cough when Old Maggie’s guest was handed a large bowl of thick broth and a spoon. The crone sat down with her own meal and joined her visitor in staring at the dancing fire while they ate.The young woman was the first to speak. “Serendipity?” the young woman quizzed as she took the last bite of soup. Old Maggie stood up and took her guest’s empty bowl and tea cup to the table, returning moments later with a plate of ginger cookies and another cup of the healing brew. She sat back down and took her own soup in hand, but she did not raise her spoon. Rather she explained. Old Maggie dipped her spoon and sipped the soup until the bowl was empty even though the young woman had responded to her statement with another question. Neither one felt an immediate answer was required. This was a time for letting thoughts float and the older woman waited until the silence invited more reflections. “Do you sew?” Old Maggie asked.